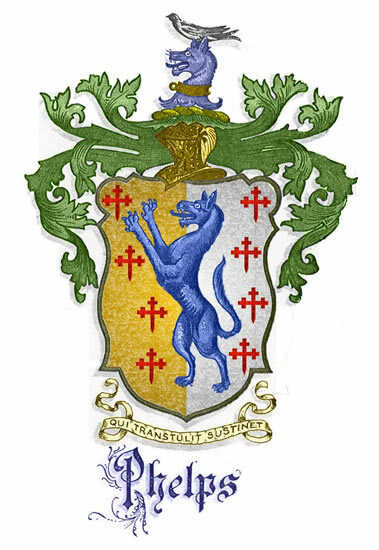 The blazon would be described as, "A wolf's head erased azure, collared or, thereon a martlet sable, per pall argent and or ar. a wolf salient azure between eight crosses crosslets, fitchy GU." The helmet or helm is not a part of the official blazon, or description of the arms. The helmet varies with the bearer's rank, the century represented, or the herald's or artist's preference. The "leaves" or mantle are not a part of the official blazon (except that sometimes the colors are specified). The design varies with the herald's or artist's preference. The mantle is said to represent the cloth that hung from the wreath and protected the back of the head and neck, even though it may often be depicted more like the leaves of a plant. The shape of the shield changed through the centuries at the discretion of the heraldic artist.